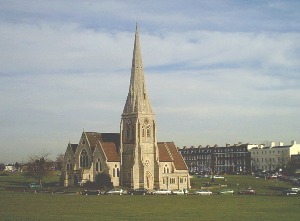 Blackheath is a comparatively new village which grew up in the 1820's to cater for the middle classes moving into the area; a development which increased with the coming of the railway in 1849. There are lots of attractive buildings both large and small to view and some quite rural sections on this 3½ mile circular walk from Blackheath Station. There are plenty of places for refreshments in the Village. The Age Exchange Centre opposite the station is worth a visit. It has displays, community library, a shop and cafe. The station, designed by George Smith, was built on the site of Hallys Nursery. Lloyds Bank took over the the former Alexandra Hall and Swimming Bath (built 1863) in 1928. Selwyn Court was built in 1936 on a site previously occupied by the Proprietary School (1835-1907). This is part of the Cator Estate, developed in the 1820s by John Barwell Cator, which has a number of attractive houses in a variety of styles. The Gables and Windermere are by Philip Aston Webb and number 10 by Patrick Gwynne (1968). St Michael & All Angels Church was designed by George Smith and built in 1828-30 as a proprietary chapel. The junction here marks the site of Gregory Pages Wricklemarsh House of 1723 by John James. At the end is a pond. Brooklands was designed and built by local architect George Smith as his home in 1825. There are a number of Span houses of 1958-63. This continues through the Cator Estate. Just beyond the gates to the right is Morden College, attributed to Christopher Wren. These almhouses were built in 1695 with funds provided by John Morden to house merchants who had fallen on hard times. To the left is the Grade I listed Paragon of 1794-1805 designed by Michael Searles. The original 14 houses were re-developed as 100 flats after WWII bomb damage. Colonnade House was built in 1804 and Paragon House (also by Searles) in 1794. Pond Road is the former drive to Wricklemarsh House. At the end of the road is the Prince of Wales Pond and the Princess of Wales pub named after Caroline of Brunswick, wife of George IV. The English team for the first rugby international was selected here in 1871. On the right is All Saints Church built in 1857 by Benjamin Ferrey as the village's parish church. This triangular area had a temporary Wesleyan Chapel, a dairy, some outbuildings and some insanitary houses until 1866 when it was cleared during the development of Royal Parade. A village school was built to take 120 pupils in 1851 on the site of Queen Elizabeths Well. The school remained in use until 1939. The building later became a library (in 1965) and then commercial premises. Some small shops built in the 1870s remain. This street was developed in the 1870s with houses and workshops. At the end is an old fire station building used until 1909. The area of heath opposite was known as Washerwomans Bottom as it was used to dry clothes. Go left at Royal Parade then cross and go left along Tranquil Vale. The Crown pub has been in existance since 1758. Adjacent was the old post office. A little further along are some attractive late 18th century weather boarded cottages in Collins Square which were restored in the 1960s. Opposite ONeills was formerly the Three Tuns (still depicted) which has been on the site since 1726. Overcrowded and unsanitary houses were cleared from here and the present houses built in the 1890s. Many have attractive tiles. These were constructed in the 1760s on land belonging to the Morden Estate (note property marks). At the end is the Hare & Billet pub overlooking the pond of the same name. The chinese style building was a summerhouse for Montagu House, both used by Caroline of Brunswick. Montagu House, which stood next to Ranger's House on the edge of Greenwich Park was demolished in 1815. Return along Eliot Vale and go left along Heath Lane which becomes a footpath. Go left at Lee Terrace, right at Dacre Park and left along Quentin Road. Continue right along Lee Terrace then left around Lawn Terrace. On the left is the Quaker Meeting House (1974) and former Congregational Church (1853/1957). The 'Tea Caddy' houses at numbers 11-17 were built as Seager's Cottages. At the end go left back to the station. The former School for the Sons & Orphans of Missionaries (built 1857) has been taken over by the Blackheath Hospital.